Plumbing leaks can be an absolute nightmare for homeowners. Whether it is coming from a burst pipe, a hidden leak, or a malfunctioning dishwasher, plumbing leaks can cause extreme damage to your household if it is not addressed quickly. One of the biggest threats that plumbing leaks can cause is the buildup of mold and mildew in your house. Mold and mildew can cause severe health problems if not taken care of appropriately. If your home has experienced a plumbing leak, do not hesitate to call our disaster cleanup experts before it becomes a bigger problem. Disaster Doctors in Salt Lake City, Utah is here for all your plumbing leak repair needs. Call us at 801-210-1988 as soon as possible so we can prevent any further water damage in your household. Disaster Doctors has been servicing the SLC area for over 10 years. We have the plumbing leak repair experience necessary to ensure that your household receives the water damage cleanup services it needs to get back to normal. We understand that time is precious when it comes to water leak repair, and our services are available 24/7 at your convenience. We also accept insurance to help with your costs. Choosing to not hire professionals could cause more costly repairs in the future. Don’t take the risk! Our highly trained technicians are friendly, and ready to help you with all your water pipe leak repair needs. Our staff receives continuous training year round to ensure that they are experts in their field, which includes utilizing cutting edge equipment that we provide. Some of our equipment we use are high powered fans and vacuums to remove moisture, as well as the Flir E5 thermal imaging camera. The camera allows our staff to identify lingering moisture that can’t be seen by the naked eye, and much more. Our staff is certified by the Institute of Inspection, Cleaning and Restoration Certification (IICRC). We do this to ensure the highest quality of service for our community. Sometimes, a plumbing leak is not as obvious as it may seem. While a broken dishwasher may be an obvious cause for water damage, hidden dripping leaks can cause problems over a long period of time. Use these tips to identify whether or not a plumbing leak has occurred in your household. The best method to check for plumbing leaks is to check your water meter. Turn off all the water in your house, and check the water meter for any visible changes. If it begins to change, it means there is a leak somewhere in your home. Calling water damage cleanup professionals is your next step to ensuring no further damage is done. Another method you can use to determine whether you have a leak is to compare your past water bills. If you know you have been using the same amount of water month to month but see the water bill rising, then you may have a leak in your house that has been causing damage. Your next step would be to call the professionals to help locate the place of damage and begin repairs. If you feel as if there is something afoot within your household when it comes to a plumbing leak, check the places that you suspect may be damaged. The back of cabinets, behind the washing machine, and more obvious places will be your best bet. If you happen to smell foul odors coming from any of these places, it is time to call the water damage repair experts. We will arrive to your property within the hour to begin the water damage repair process. It doesn’t matter if a leak occurs at 3 in the morning or 3 in the afternoon, Disaster Doctors are here to help you. We can arrive at your property in 60 minutes or less to assess the damage quickly for immediate repairs. 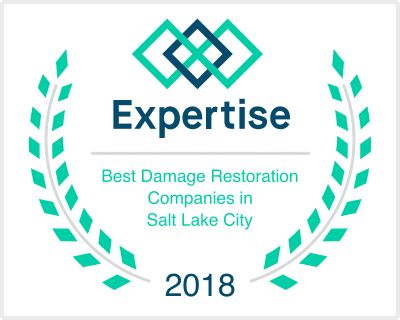 Our professional water damage experts in Salt Lake City, Utah will restore your home to normal in no time at all. Give us a call at 801-210-1988 to receive your free consultation today.